For the last ten years "Comedy at the Beach" has brought national talent to the Delaware beaches to help support the Jefferson School, a local non-profit school. 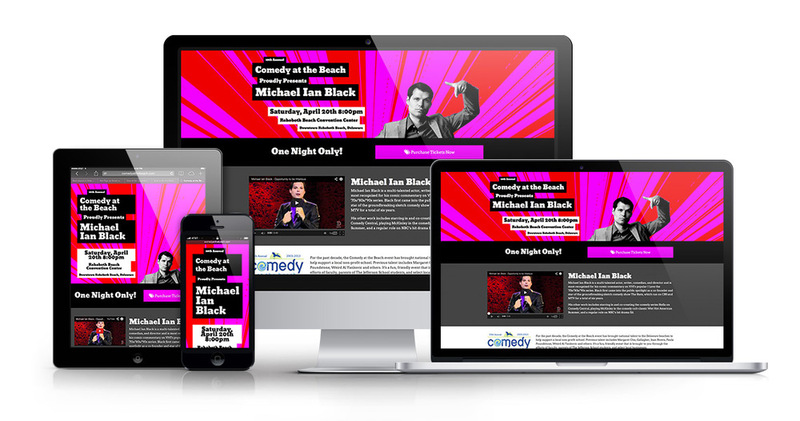 If you're old enough to remember MTV's "The State" and $240 Worth of Pudding, you'll immediately recognize this year's host, Michael Ian Black. DecalGirl.com is an official sponsor of the event, and as their web designer I was chosen to create this year's landing page concept along with Ryan Peters, the CEO and lead developer at DecalGirl. Collaboratively, we came up with the design and layout of the page featured below. We wanted it to be an easy place for visitors to order tickets, check times and get directions to the event. Bootstrap is an amazing, versatile framework and a great time saver for creating quick landing pages like this.